Billy has plans for his summer. Big plans involving time with his best friends, Charlie and Mark, and his dog Jimmy. He's graduated from high school and looks forward to relaxing before heading off to college. But things don't go as planned. From a town tragedy that puts a wedge between him and his friends, to a time-consuming new job and a beautiful girl, Billy's summer ends up taking him in a totally new direction. 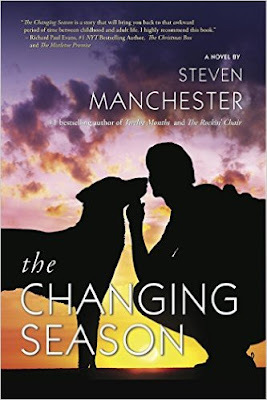 The Changing Season by Steven Manchester is a coming-of-age tale that tugs at the heartstrings. Billy is the type of character that a reader can really get behind. In many ways, he's a typical recent grad who wants to party with friends, hang out with his dog and play video games in his messy room. But Billy is also quite introspective, often thinking about what career he wants to pursue, how to deal with his canine friend's increasing age, and what to do about the terrible secret he's promised to keep. He agonizes over all of these topics, thinking through options and trying to come to the best decisions for himself and his loved ones. It's a lot for a teenager to worry about. I enjoyed this emotional story and found myself anxious to know how Billy would get through the challenges and make the important decisions about his future. I will admit that I'm not a "dog person" so while his relationship with Jimmy is sweet, it probably didn't hit me as deeply as it would for most readers. There were a few spots that felt a little slow, but overall there was enough going on in Billy's life to keep me interested and engaged through to the end. If you're looking for a heartfelt story of one boy's transition from teenager to responsible young adult, definitely check out The Changing Season. It would be a great summer read. This review was written based on a copy of The Changing Season that I received from the author in exchange for an honest review. This post includes Amazon Affiliate links. If you purchase something using my link, I will receive a very small commission but your price does not change. Intriguing. Life is never perfect or smooth.